These 2 Michigan State Zone offensive Sets are from Coach Scott Peterman’s Ultimate Zone offense playbook. 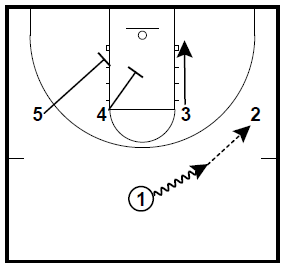 These two zone attack sets are from Scott Peterman’s Ultimate Zone Offense eBook. I hope they give you some ideas that you can add to your zone attack. The Ultimate Zone Offense and Ultimate Horns Offense eBooks are combined as this week’s eBook Bundle Special. 2 cuts to the left corner. 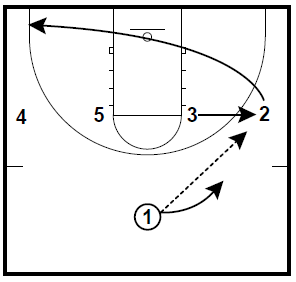 3 passes to 1 and cuts to the basket. 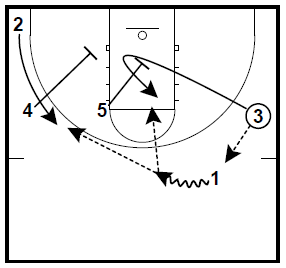 5 sets a downscreen on the middle of the zone. 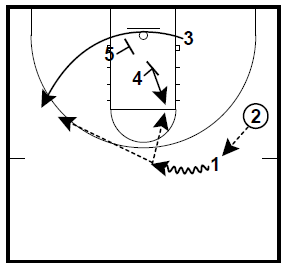 4 sets a screen on the left bottom of the zone. 1 can pass to 2 or 3 for the shot. 2 passes to 4 for the shot. 1 dribbles to the right wing and passes to 2. 3 slides to the right low block. 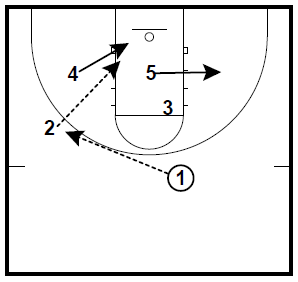 4 sets a screen on the middle of the zone. 5 screens the lower left zone member. 1 dribbles to the top of the key. 4 and 5 screen for 3. 3 cuts to the left wing. 4 steps up to the right elbow. 1 can pass to 4 or 3.